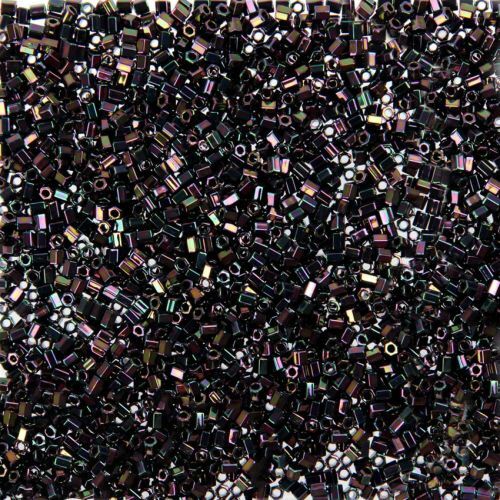 Add a new dimension to your jewellery with these Miyuki Delica hex 2 cut beads in gunmetal purple gold. These beads offer stunning effect that makes them ideal for any design that needs a stand out feature bead! Or why not just work with these beads and create something super funky! This fab little beads are ideal to work with on a loom for elegant jewellery. Beads measure approx. 1x1.6mm (Size 11). Threading hole measures approx. 0.8mm. Sold in a pack of 5g. Each pack contains approx. 500. CommentDe er skønne, men deres størrelse gør, at jeg synes de er lidt sværere at få til at matche andre seed beads. CommentI can only repeat what I have already said. I am very happy. CommentGorgeous colour, and the quality of these beads is second to none!